In the past two weeks, I've posted about organizations rocking Pinterest, Twitter and Facebook. 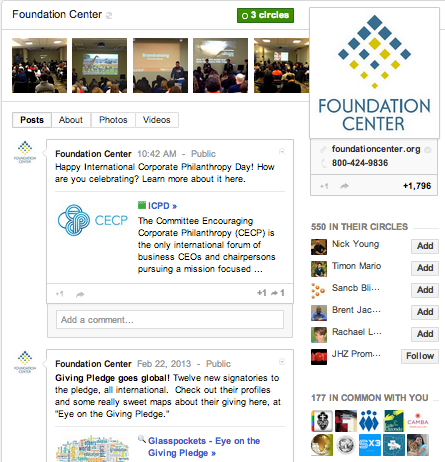 Now, it's time to give some love to nonprofits on Google+ who are doing great stuff! For my daily dose of "Awww," I follow the Animal Rescue League and Wildlife Shelter. They make great use of photos and videos to promote animals looking to be adopted, and they use great, engaging language for each caption, to tell the stories of the animals in need. Yes, I know, we give the Foundation Center a lot of love here on the blog and on Twitter, but that's only because they're awesome. They've really taken the ball and run with it on Google+, posting a variety of fundraising/foundation news, as well as the occasional event or inspirational blog post. 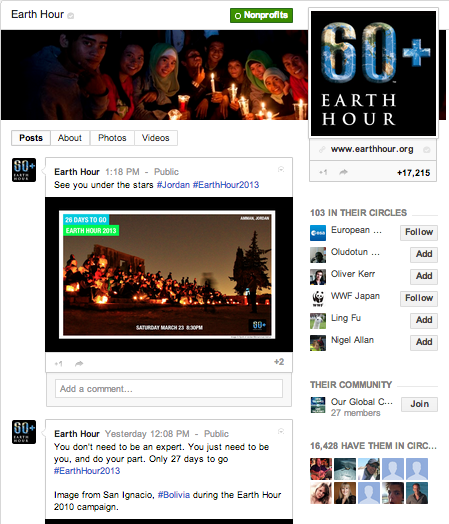 Earth Hour has been posting new photos every day with a countdown to their event. The photos are engaging, interesting, and branded to make sure everyone remembers about the event. The Sunlight Foundation is very data-driven, so naturally they post a lot of charts and graphs on their profile. But they also have a lot of great photos related to their cause of government transparency, and links to relevant blog posts. They use a healthy mix of content types to great effect. I love visiting a nonprofit's social media profile and seeing something new. The New York Public Library has a great quote series running, each one tastefully branded, singing the praises of libraries from the patrons' perspectives. They mix this evergreen content with photos from events, author profiles and more, to keep fans of libraries everywhere engaged. The Pew Research Center (a fine organization whose name will always make me think of this picture) shares a ton of useful, up-to-the-minute data in easy-to-grasp charts and blog posts. They showcase snippets of studies, which works beautifully on social media. 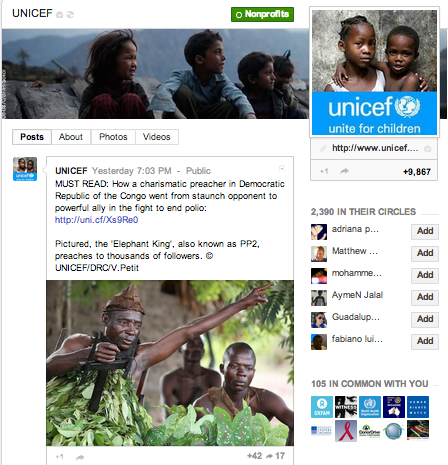 Like the rest of its branded properties, UNICEF's Google+ profile is heavily driven by great, evocative photographs with captions that drive viewers to take action. Who did we miss? Post in the comments your favorite nonprofits to follow on Google+!